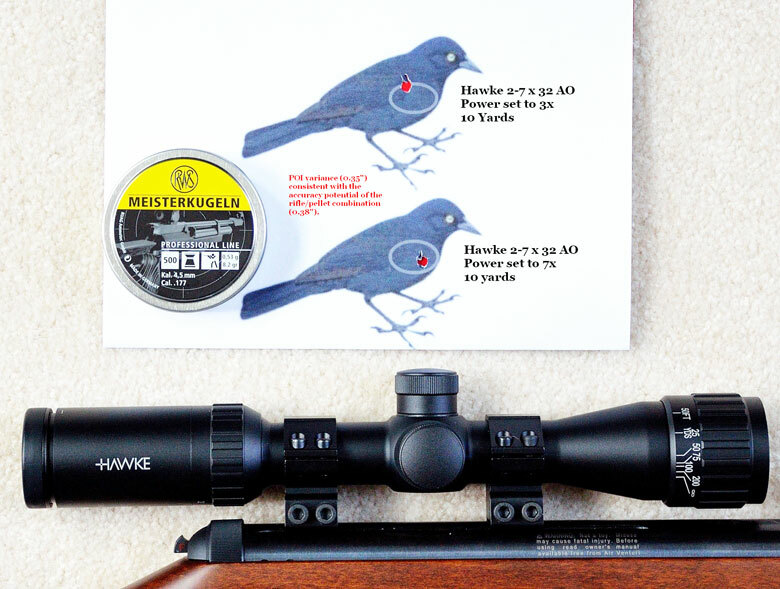 This is Part One of my review of the Hawke 2-7×32 AO air rifle scope. 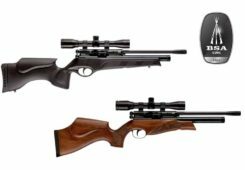 If you are relatively new to air guns, the most sophisticated air rifle scope you’ve encountered is probably the 4×32 entry level glass provided with air guns selling in the $100.00 price range. I got a 4×32 scope with the Remington Express, another with the Beeman Teton Gas Ram, and a third with the Beeman Marksman. All were fixed 4 power with 32mm objective lens (4×32) scopes. 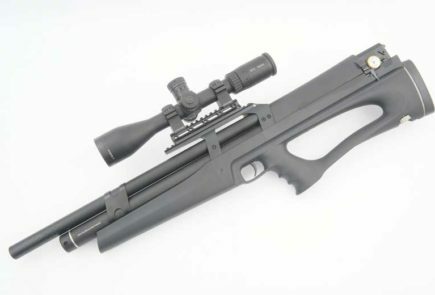 All had simple – duplex – cross hair reticle, lacked an adjustable objective lens, and had the parallax set beyond normal air gun range. 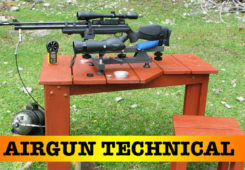 Like many people, I struggled with all three of these scopes on my indoor 10 yard range. 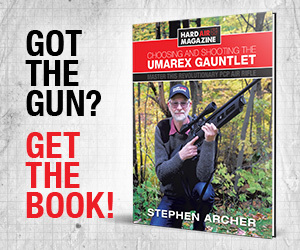 And I vowed that soon I would ask HAM Publisher Stephen Archer to recommend an air rifle scope which would serve me better. But before that happened, Pyramyd Air sent me the Diana 240 Classic “Bundle” complete with a Hawke 2-7×32 AO scope. Click these links to read Part One and Part Two of this review. My initial impression was that the advanced features of this $99.00 Hawke 2-7×32 AO air rifle scope were “overkill” in an air rifle scope. 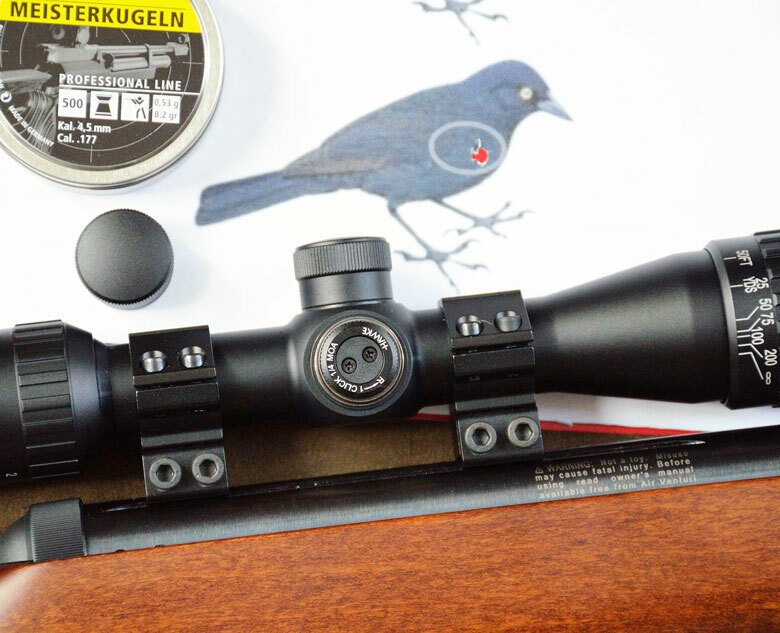 I reasoned that few beginning shooters would need all of the features packed into the Hawke Advantage optics. It took a lot less time than I had imagined to become familiar with the scope and the supporting X-ACT/Chairgun Pro Ballistics programs. 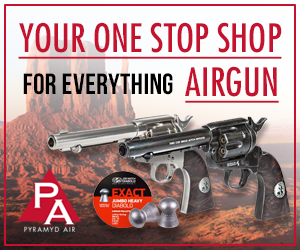 And once I became comfortable with these advanced features, I realized that they are features any beginning airgunner can put to good use. 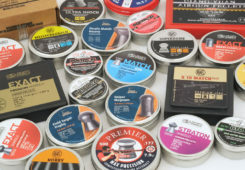 Let’s list a few, and see how they will improve your shooting enjoyment and performance. The air rifle scope provided with the Diana 240 Classic bundle is described thus: Hawke 2-7×32 AO. The AO stands for Adjustable Objective Lens. But the first scope adjustment referred to in the manual is Ocular Lens Adjustment. These terms are not interchangeable. The Ocular lens is the adjustable lens closest to the eye and marked with a (+0-). The Objective lens is positioned at the front (target) end of the scope and calibrated with distance (Ft/Yd) markings. The Ocular adjustment focuses the eye on the cross hairs (reticle), and the Objective adjustment focuses the eye on the target. 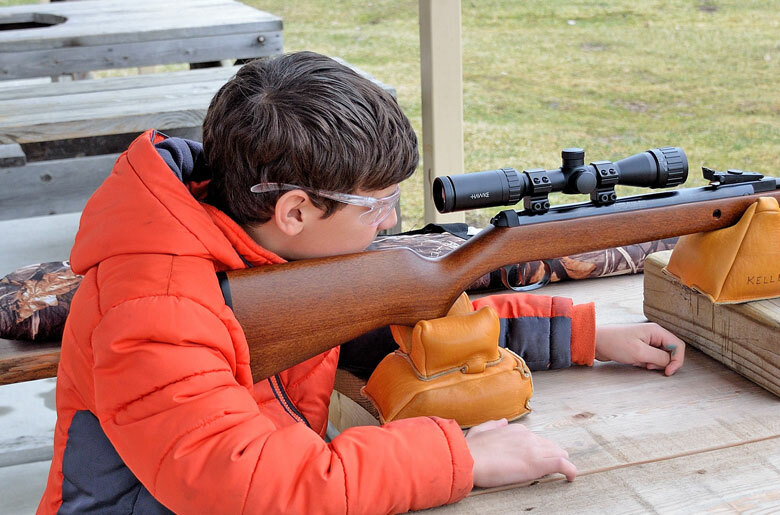 Every air rifle scope, even the entry level glass on my Remington Express, has an Ocular adjustment. But only more sophisticated scopes have the AO (Adjustable Objective) feature. Ocular Adjustment: set the scope to the highest power, then focus the cross hairs against a neutral (white/sky) background. Once the reticle is in focus for your eye, you won’t need to change this again. Adjustable Objective: Now that the cross hairs are in sharp focus, adjust the Adjustable Objective (AO) lens so that the target is in sharp focus at the distance you intend to shoot. When the target distance changes, you will have to re-adjust the Objective lens for the new distance. (This is just like focusing a manual focus camera). Parallax: Parallax is the sighting error inherent in scopes that DO NOT have an Adjustable Objective lens. Putting the target in sharp focus with the AO lens normally eliminates, or minimizes parallax error. So the AO feature of the Hawke air rifle scope actually accomplishes three things. Firstly it allows you to focus on the target regardless of the distance. 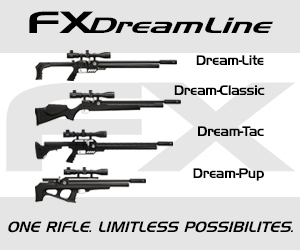 With an entry level 4×32 air rifle scope, you are forced to shoot 10 yard, indoor range targets with a fuzzy focus. 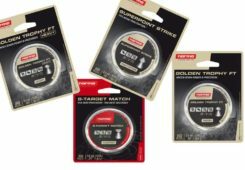 Sharp focus will mean better accuracy and more fun for the shooter. Secondly, It minimizes or reduces parallax sighting error. If your head is not perfectly positioned behind the ocular lens when you align the cross hairs on the target, the cross hairs will remain positioned on the bulls eye. This feature also improves accuracy. With an inexpensive scope, the cross hairs will move around the target when your head moves ever so slightly. This happens more often than you might suspect. Third, the AO feature of the scope can act as a rangefinder. 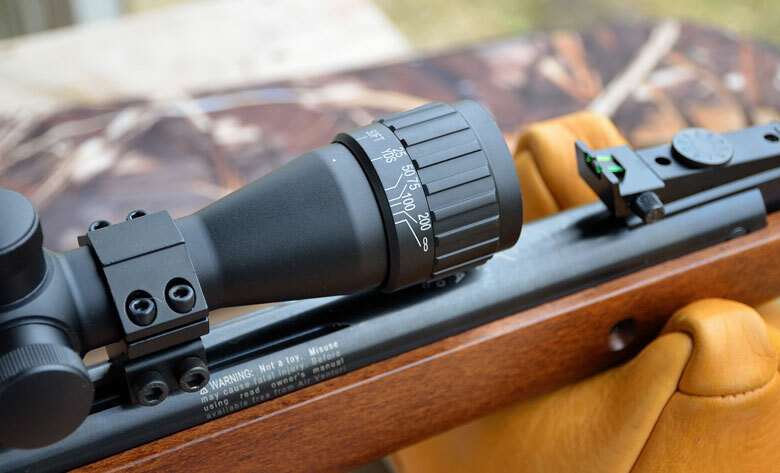 Set at the highest power, when you turn the AO lens to sharp focus, the scale on the air rifle scope will indicate the approximate distance of the target. For greater accuracy, you can re-mark your scope scale to reflect more precise distances given your vision requirements. Some use masking tape to record their personal distance scale. When you calibrate your scale, remember to measure the distance with a tape, and focus on a target or object which has sharp contrasting features. 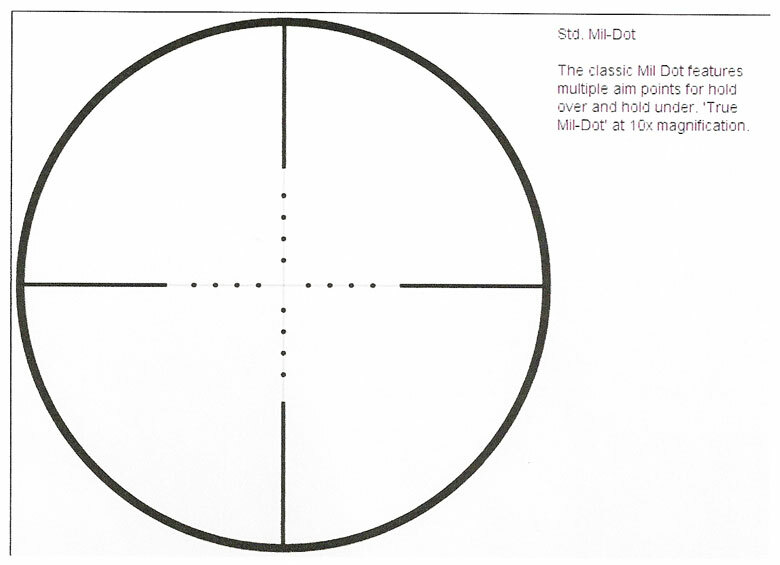 Mil-Dot Reticle: Entry level air rifle scope are equipped with simple, basic cross hairs, or duplex reticle. You position the intersection of the two cross hairs on the target and, assuming the gun was sighted in for the precise distance at which you are shooting, and you properly execute the shot, the pellet should hit where you aim. So far, so good. But what if the target is closer or farther than the distance at which you sighted in the gun? Well, you use “Kentucky Windage”. You ESTIMATE how high, or how low you should hold to hit the target. Sounds problematic ? It is, particularly if you are using a variable power scope. There’s a better way. 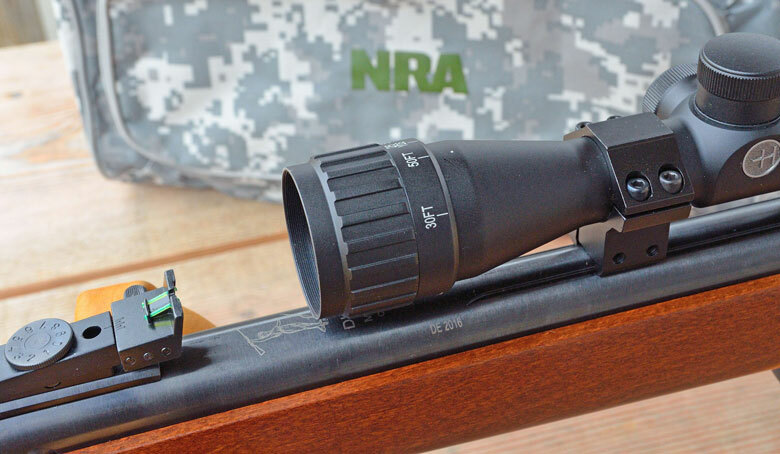 An air rifle scope with a Mil-Dot reticle (ie. 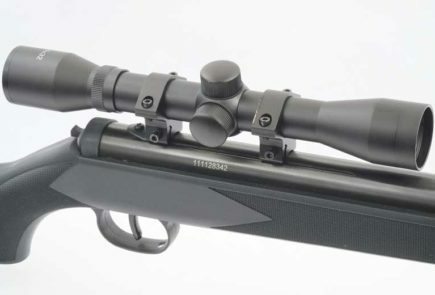 the Hawke 2-7×32 AO air rifle scope), allows you to choose another aim point, other than the intersection of the simple cross hairs, to more accurately place your shot. And how do you know which dot on the cross hairs you should use for any given distance? 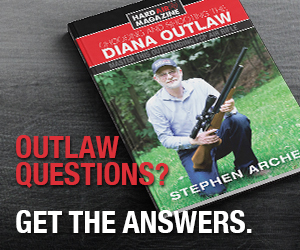 That’s where the Hawke X-ACT/Chairgun Pro programs come into play. 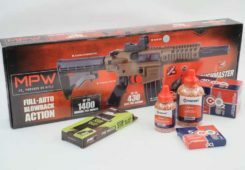 They are fundamental ballistic programs which, when combined with the Hawke scope, helps you to hit your point of aim. And this is regardless of the target distance, amount of cross wind, or degree to which the shot angle departs from horizontal. Variable Power Scope: One of the most useful advanced features of the scope is the variable power. You can set it for 2 power for close in targets, or any power up to seven as the target gets further from the gun. If your basement range is 30 feet long, you can set the power to TWO, then focus the AO lens and shoot targets which are in clear, sharp focus. The Hawke will be close to Parallax error free at that range. The fixed, 100 yard parallax setting in your 4×32 scope will have you scratching your head wondering why you keep getting occasional flyers. 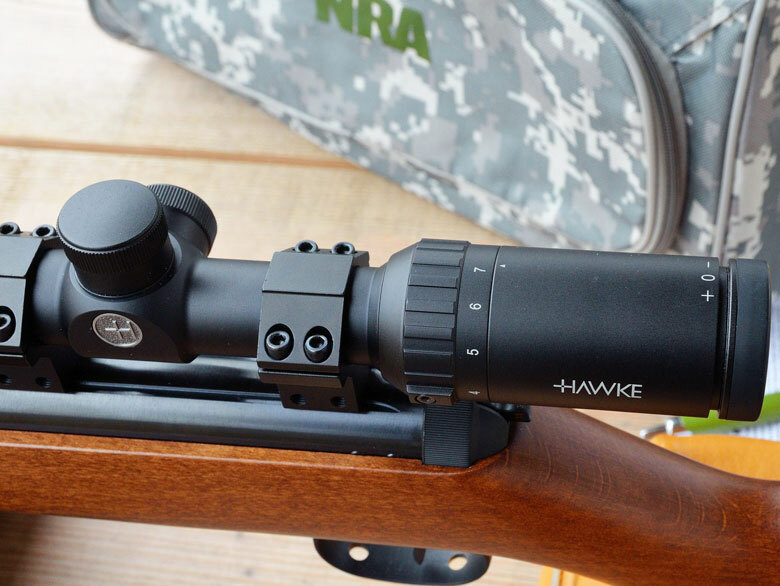 Weight and Eye Relief: The Hawke 2-7×32 AO air rifle scope weighs under a pound. The Diana 240 + rings + scope weighed just over 7 lb. 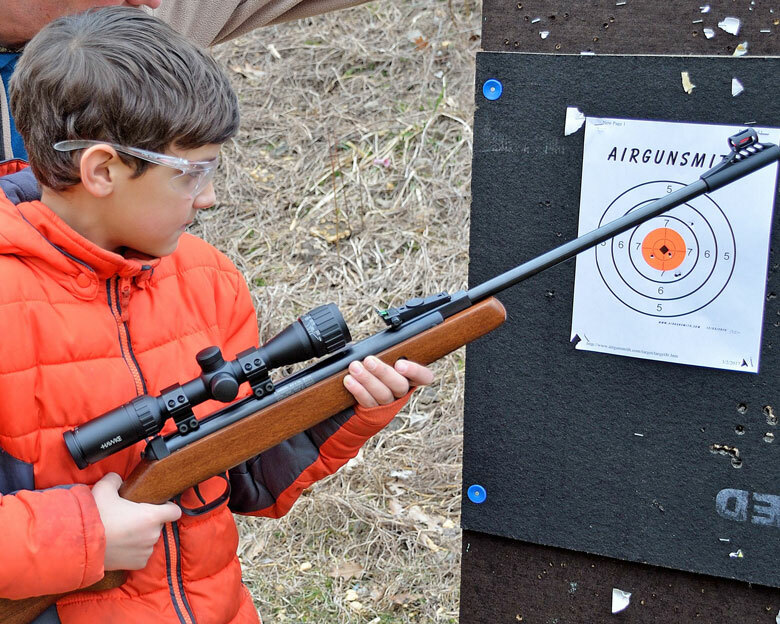 That’s a pretty good weight for an adult carbine, and seemed to be a comfortable weight for 10 year old Logan. I didn’t measure the eye relief on the Hawke, the spec is is 3.5 inches. I just mounted the scope so that the view through the air rifle scope was optimal when I mounted the gun. Looking at Logan settling into the scope for the very first time, it looks like my scope placement worked equally well for him. I’m not sure what Logan saw, but he hit the target every time, and the orange bull twice at 25 yards. A score of 37X50 is pretty good for his very first attempt with the scoped Diana! 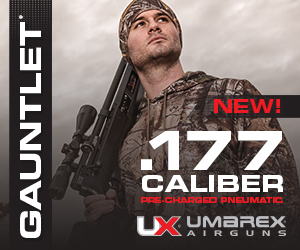 Adjustment Precision: As you probably know, when you change pellets, the POI (Point Of Impact) of your gun will also change. 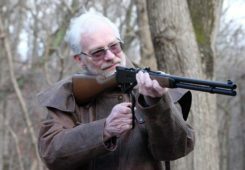 (Just check out the test targets in the HAM test reviews where the same gun is shot with different pellets). 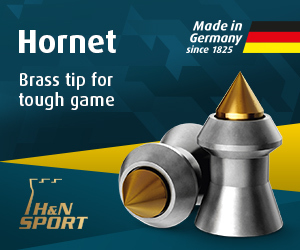 That means you have to use the turret adjustments on your scope to dial in new cross hair positions so you can hit the bulls eye with different pellets. 1. the turret adjustment calculation didn’t always move the POI to the desired location (most likely, the bulls eye on your target). 2. And even if it did, the POI would move around on the target for a number of succeeding shots, until the cross hairs settle. That is a bit disconcerting. When I first mounted the Hawke air rifle scope with the rings provided in the Bundle, it wasn’t precisely on target. So I measured the distance the initial pellets struck from my aim point, both horizontally and vertically, and dialed in the adjustment which should place the pellets on the bulls eye. No surprise! The next shot hit the bulls eye dead center. The windage and elevation turret adjusters are set to ¼ MOA. That means that 4 clicks is equivalent to an inch of movement on the target at 100 yards, At 10 yards, it takes 40 clicks to move the POI one inch. The first shot from the gun at 10 yards was 2.5 inches to the right and ½ inch high. So I dialed in 100 clicks left, and 20 clicks down. BULLSEYE! And the aim point didn’t shift with successive shots. That’s the kind of precision I would expect from a much more expensive scope. I was also curious as to how the POI would change as I changed the power of the Hawke air rifle scope. So I shot a Silhouette Blackbird from 10 yards at 3 power and another at an adjacent Bird at 7 power. The POI didn’t change appreciably when I changed the Power setting on the scope. 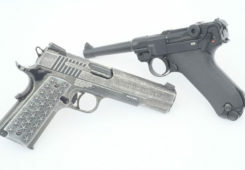 The difference in the POI was within the margin of error based on the accuracy potential of the Meisterkugeln Rifle Pellets in the Diana Classic. 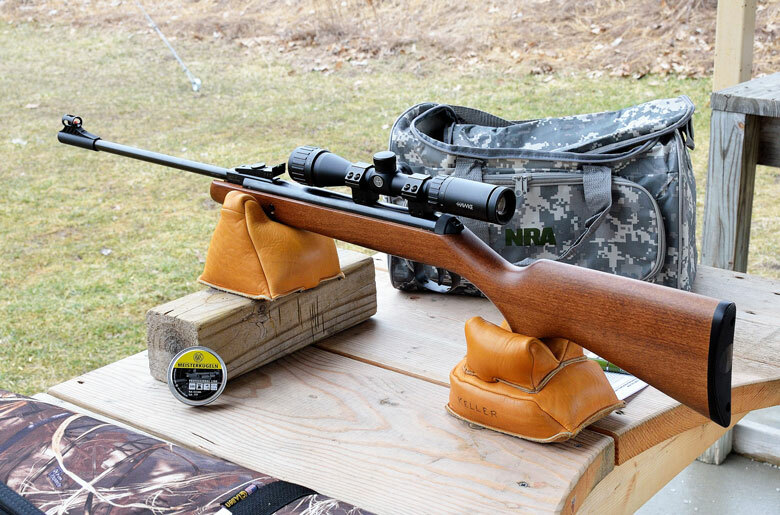 Next time, we’ll tell you how you can use the Hawke X-ACT/Chairgun Pro Ballistic programs, and the Mil-Dot feature of your air rifle scope to make shooting at varying distances more precise and, more enjoyable.